As I was working through Day 18 of the FLOW Journal Project , it occurred to me that many of my successful adaptations to accommodate arachnoiditis were ALL about breaking the rules. Living with Arachnoiditis meant that I needed structure and time management to keep my body functioning at its best. However, ADAPTING to arachnoiditis meant that I had to break most of the “rules” and “systems” that had defined my life prior to this medical injury. While my trusted medical care providers were trying to help me figure out what had actually happened, I remember saying that if I could just go through life suspended from boots attached to runners on the ceiling- like clothing at the dry cleaner’s- I would be fine. Although that was NOT a practical adaptation to make, it was a light bulb to the fact that I needed to STOP trying to function within traditional, socially acceptable boundaries. I hated being in bed looking at the ceiling..doing NOTHING. In the beginning there was so much pain that I didn’t really notice. But, gradually it became evident that horizontal time was controlling the pain. 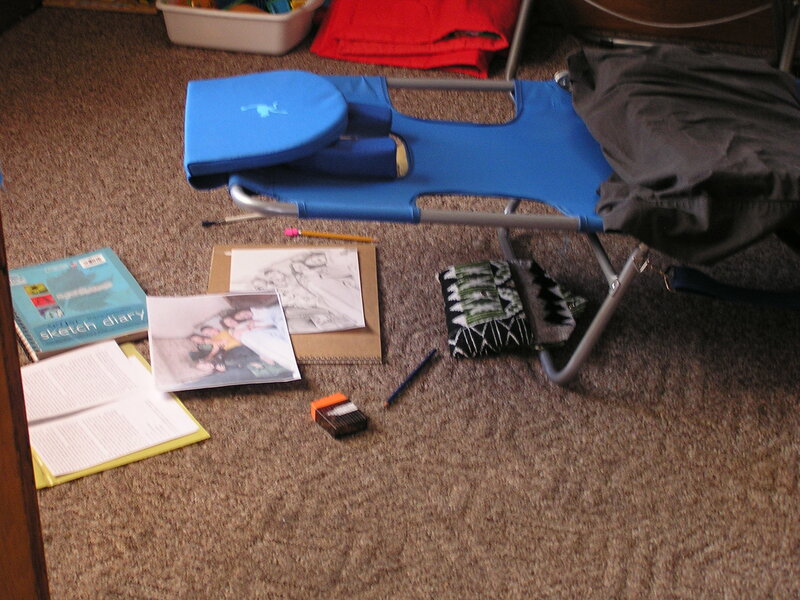 I had to figure out some way to be productive WHILE I was horizontal. 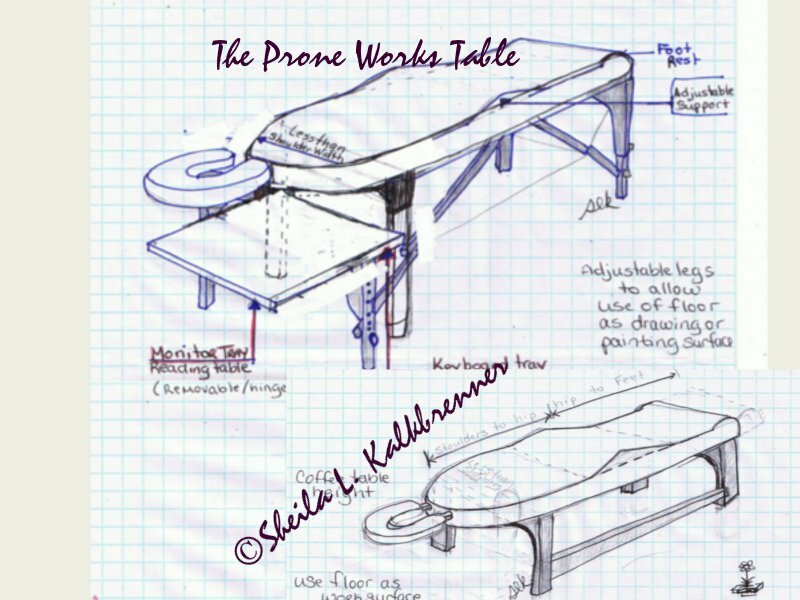 I designed the ProneWorks table and consulted with occupational therapy to find out more about what my body would need to work this way. It became part of my studio business plan and I incorporated the design into my small business grant application. It was going to cost $1800 to make the first prototype. The week before I was scheduled to meet with the carpenter/upholsterer to finalize arrangements, I discovered the Ostrich Cot. Although it did not have a built in structure to accommodate standard positional cardiovascular concerns, with a price tag of $49.99 at that time, I had to try it. Thinking outside of the box helped me preserve my independence. With appropriate timing to permit proper blood flow, the Ostrich Cot became the foundation for me to resume making art. I know I am still working to adjust my ideas about “the box” because I get self-conscious using the cot in front of other people. Being/working in the prone position feels simultaneously liberating and vulnerable. I am hoping to demonstrate the cot and allow others to use it during the Opening Reception for our FIRST public art exhibit. Art ACTIVITY #18 Today, make a simple doodle or sketch of the ideal environment OR perfect assistive device that would make living with arachnoiditis easier for you. This environment can contain known objects or new innovations that you fantasize about. There are NO rules here. If drawing is uncomfortable for you, then use cut out images and paste together a NEW device suited just for you. Defy Gravity. Extended Activity Make a list of FIVE impractical activities you can do that support and will not conflict with your arachnoiditis-related needs. 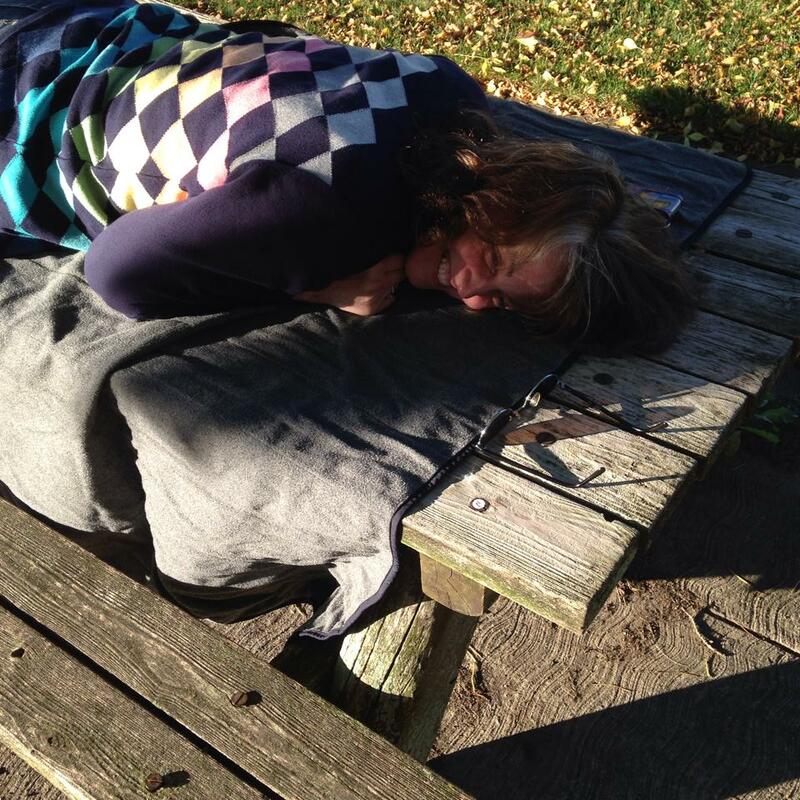 Take a blanket and lay down in a public place…even if~especially if~ my body doesn’t really NEED to lay down right now. Fight Cabin Fever~ going out is hard, invite people into the studio but, ask or designate an alternate host/hostess to stand-in for me while I visit with everyone. Make my own ergonomic workstations…again. You are invited to share your ideas, sketches, collages, and discoveries here. Use the Registration Form if you would like your work today to be included in the FIRST Art For Arachnoiditis Project Public Exhibit. CALL FOR ENTRIES ENDS Feb. 15, 2015.